Through life, we want to have as many new experiences as possible but in the end what really matters are the simple things. This is found in many cultures and known as socioemotional selectivity theory. We simply want companionship. Most importantly, the patient must be content with the decision. Which means, as hard as it may be, ask them what would make them comfortable-giving a sense of control. A “good death” can be achieved just by talking about it. In recent research, patients and families claim there are three important factors to consider. All in all, comfort and being content are the top priorities. Hospice care professionals take pride in honoring the wishes of the patient. So take the time to think about how you would prepare for your “good death.” What would make you most content at the end? Houston is known for being the top city for cultural diversity, passing New York City and Los Angeles. Understanding how different cultures approach death is very important. Through hospice, we provide grief services for everyone involved, but cultural practices are often overlooked. There are many transitions that happen at the end of life and through these transitions there things you should consider. Once these things have been observed, the hospice provider can give the patient the proper care. The patient may believe that pain and death are a part of the journey of life. They may also believe that their family must be involved in all areas of their care. Some have religious limitations or rituals important to their end of life process. Some may want nondisclosure about the serious illness of their loved ones. The reasoning behind this is discussing death is impolite in some cultures, or they don’t want unnecessary anxiety felt by their loved one. However, in 1990 the Federal Patient Determination Act and Patient Self Determination Act were passed, emphasizing the need for the patient’s consent. The way to handle these situations is to be respectful of different cultural practices. By having respect and appreciation it will be easier to form a relationship with the patient and their family. Expanding your knowledge of different practices is important as well. The goal of hospice is to bring comfort to the patient and understanding their beliefs is a big part of that. Accredited Hospices of America is specialized type of care for those facing a life-limiting illness, their families and their caregivers. Accredited Hospices of America care addresses the patient’s physical, emotional, social and spiritual needs. Accredited Hospices of America care also helps the patient’s family caregivers. Accredited Hospices of America care takes place in the patient’s home or in a home-like setting. Accredited Hospices of America care concentrates on managing a patient’s pain and other symptoms so that the patient may live as comfortable as possible and make the most of the time that remains. Accredited Hospices of America care believes the quality of life to be as important as length of life. Choosing to elect hospice care is an important decision that can greatly benefit the quality of life for a patient with a life-limiting illness in addition to proving support to a patient’s family during a difficult time. Is hospice for those with cancer only? No, Hospice patients are living with a wide range of diagnoses including heart disease, cancer, dementia, lung disease and others. However, regardless of a patient’s condition or age hospices open their doors and their hearts to all persons diagnosed with life-limiting illnesses and their families. Hospice services can be provided to a person with limited life expectancy and his/her family, wherever they live. This means a patient living in a nursing facility or long-term care facility and his/her family can receive specialized visits/contacts from physicians, nurses, aides, chaplains, social workers, and volunteers, in addition to other care and services provided by the nursing facility. The hospice and nursing home will have a written agreement in place in order for the hospice to serve residents of the facility. Typically, hospice care starts as soon as a formal request or a ‘referral’ is made. Accredited Hospices of America will visit the patient within 48 hours of referral, pending the physician’s approval, providing the visit meets the needs and schedule of the patient and family/primary caregiver. 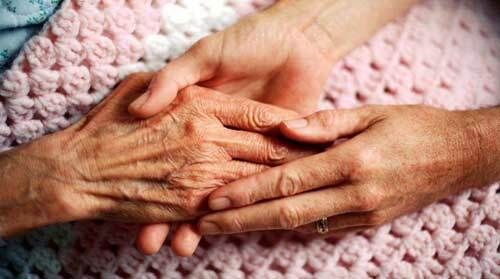 Hospice care begins within a day of two of referral. However, in urgent situations, hospice services may begin sooner. The patient of a family member may “self-refer” and request an evaluation for eligibility for receiving hospice services. What specific assistance does hospice provide? Accredited Hospices of America hospice patients and their families are cared for by a team of doctors, nurses, social workers, counselors, aides, spiritual, caregivers, therapist, and volunteers- working together in a team to address the patient’s and family’s identified needs. In addition, hospices help provide medications, supplies, equipment, hospital services, and additional helpers in the home, as appropriate. Accredited Hospices of America’s nurses and physicians are experts in the latest medications and devices for pain and symptom relief. In addition, physical and occupational therapists assist patients to be as mobile and self-sufficient as possible, and they are often joined by specialists schooled in music therapy, are therapy, diet counseling,and other therapies. Accredited hospices of America believes that emotional and spiritual pain are just as real and in need of attention as physical pain, so it addresses these, as well. Counselors, including spiritual caregivers, are available. Accredited Hospices of America will asses your needs, recommend any necessary equipment, and help make arrangements to obtain it. Often the need for equipment is minimal at first and increases as the patient’s needs change. Hospice coverage is widely available provided by Medicare nationwide, by Medicaid in Texas, and by most private health insurance policies. To be sure of coverage, families should, of course, check with their employer or health insurance provider. If the patient is eligible for Medicare, will there be any additional expenses to be paid? Medicare covers all services and supplies related to the life-limiting illness for the hospice patient. In some hospices, the patient may be required to pay a 5% “co-payment” on mediation and a 5% co-payment for respite care. At any time during a life-limiting illness, it is appropriate to discuss all of a patient’s care options, including hospice. By law the decision belongs to the patient. Because hospice care includes family members and other caregivers, they are also considered an important part of the decision-making process. Sometimes, people have concerns about changing the focus of care from disease-modifying to focus on comfort care and quality of life. Accredited Hospices of America’s staff members are highly sensitive to these concerns and are always available to discuss them with the patient, family and physician. If you are not familiar with the term ”palliative” care, it is a medial specialty focused on managing the physical and emotional impact of serious illness. Sometimes people think palliative and hospice care are synonymous. They are not. Some organizations provided both hospice and palliative care. Hospice is a specific branch of palliative care for those with a terminal diagnosis. It is important to know you DO NOT have to forgo curative treatment or have a terminal diagnosis to receive palliative care. HOUSTON, TX, JUNE 12, 2015, Accredited Hospices of America today announced that it has earned The Joint Commission’s Gold Seal of Approval® for Hospice Accreditation by demonstrating continuous compliance with its performance standards. The Gold Seal of Approval® is a symbol of quality that reflects an organization’s commitment to providing safe and effective care. Accredited Hospices of America underwent a rigorous on-site survey in June, 2015. During the survey, compliance with hospice care standards reflecting key organization areas was evaluated, including the provision of care, treatment and services, emergency management, human resources, individual rights and responsibilities, and leadership. The Joint Commission’s hospice standards are developed in consultation with health care experts, home care providers and researchers, as well as industry experts, purchasers and consumers. The standards are informed by scientific literature and expert consensus to help organizations measure, assess and improve performance. Accredited Hospices of America in Houston, Texas is a leading provider of hospice care and our goal is to provide the best and most comprehensive hospice care services available. Hospice care is not a standardized service; therefore, hospices cannot, and do not, provide the same level of care. We are different from other hospices in the Houston area because of our dedication to excellence and the inclusion of families in our care plans.